Quilt Story: Spontaneous Threads quilt finish.. This quilt comes from Stephanie of Spontaneous threads. Pretty amazing huh? Love the orange and gray. The more I see orange around makes me like it more and more! I love the scrappness and wonkiness of this quilt. Quilt finish gorgeousness here... Be sure to check out Spontaneous threads blog for more inspiration! The Perfect Storm- for me that is….. It doesn't happen very often-that unique combination of circumstances and ideas (old and new), but it happened just recently to me and if I can get all the stars and planets to align (ya, right) I might be on to something. Let me begin at the beginning, I have had this quilt for as long as I can remember. It's very old, very soft and very fragile. I don't know who made it, but it's totally made by hand. Cut, pieced and quilted without any electricity what-so-ever. These small orange squares are 1" in size. Look at that tiny, uniform hand stitching. I have always loved this quilt and wish I knew more about the person who made it. Besides it's mysterious creator, one thing that always makes me smile is it's color. It's orange and white- sunny and bright. Someone once told me that they thought it was probably not orange but red and that it has faded with time and use. But I disagree, something tells me it's always been orange (faded red to me is pink) and that makes me smile all the more. 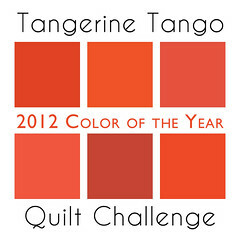 I'm guessing 100+ years ago, orange wasn't a popular color, let alone the color of the year, like Tangerine Tango is this year, but someone liked it enough to make a quilt with orange proudly displayed. Which got me thinking that in 2012, I NEEDED to make a quilt for myself. (I haven't yet you see). Then along came the Tangerine Tango challenge……. and the MQG challenge and a January FRMQG meeting and I got to thinking, perhaps these are just the push, my proverbial "Tail Wind". FMQ: (on my Bernina 180) using: a FMQ pattern of tailed-swirls and fillers to resemble "wind" currents originating from a centrally placed compass rose. Thread: Coats and Clarks 100% quilting cotton in winter white, 40 weight. I used well over 2000 yards of thread to quilt this project. Batting: Hobbs Tuscany Collection, 100% wool batting which needs to be quilted every 3". 1. Oranges:(mainly from stash and small yardage approximately FQ size and smaller) 5 Kona "orange family" solids (3 little pieces left over from the Robert Kaufman solids challenge charm pack in brights); Kona solids in school bus and coral; Kaffe Fassett- Rowan Line Dance; OZ by Sanae for Moda; Floralicious by Michael D'Amore for Benartex; Taza by Dena for free Spirit; Woodland Friends by Ellen Crimi-Trent for Clothworks, Half Moon by Moda; Grad Bazaar by Patty Young for Michael Miller; Metro Living Circles by Robert Kaufman; Fresh Flowers by Deb Strain for Moda; Garden Divas by Jane Sassaman for Free Spirit; A day in the Life by Mummysan for Robert Kaufman, Aviary 2 by Joel Dewberry for Free Spirit; Innocent Crush Maybe by Anna Maria Horner for Free Spirit; Treasures and Tidbits by Piece O' Cake Designs for Robert Kaufman; Tonal Kaleidoscope Gypsy Bandana by Pillow & Maxfield for Michael Miller; Aldo fo Zippy by Jenn Ski/Lilla Rogers Studio for P&B Textiles; Kensington Studio for Quilting Treasures; Simon + Kabuki for Eandl Design, Inc.; Terrain by Kate Spain for Moda; Mingle by Monaluna for Robert Kaufman; and various wonderful orange scraps from Michelle L. (Flickr- I like Orange too) from the Goodie Bag swap (round 2). 2. Grays:(mainly from stash and small yardage as above) Kona medium grey; "Quilters Linen" by Robert Kaufman, Metro Living Circles by Robert Kaufman; Alexander Henry Fashion for Home; Little Apples by Aneela Hoey for Moda; Ta Dot by Michael Miller, and small scraps from Michelle L. (Flickr- I like Orange too). The quilt top pieces were laid out in a random pattern based mainly on what appealed to me. One note of caution, and I should have foreseen this had I (been organized and) drawn this out in advance; was……... the piecing of the top became puzzle-like containing only one width of quilt straight seam line (yikes). I lay my quilts out on the floor as I don't have a design "wall". If you look closely at about 9 o'clock you can see a large grouping of quilt blocks with no obvious (to me) way to assemble them without some creative and non-linear piecing. In the end I was left with about 7 medium sized sections and had quite the time fitting them all together in an orderly manner. It required (quite) a bit of interesting seaming but it all eventually went together. The completed top laying over the backing and the 100% wool batting, all taped to the living room floor and waiting to be pin-basted. I did lean my lesson when it came to the back! (minimal and straight piecing). What I love about this quilt is that I used many, many oranges and some (but not as many) grays. If you look closely you can see birds, bees, flowers, dots, zig-zags, spiders, sinks, a bath tub, a whisk, a dress, eye glasses, a baby carriage, a toaster, a door, a piece of cake, utensils, lots of scissors, a toy car, stripes, checks, plaid, argyll, fish scales, words, leaves, rosebuds, ducks and hats. I'd say that's quite a collection of things to see and to look for, and all of that just makes me smile. The quilting is really prominent on the back and I'm thrilled that I used so much neutral here. In the end I have a beautiful and surprisingly light-weight queen sized quilt. Although the wool batting requires denser quilting, it's incredibly light, compressible and easy to maneuver under the space available on a regular table top sewing machine. I love your quilt! It's wonderful! I agree that the vintage quilt was not originally red for the same reason as you. It would now be pink. :) And I can see why you love it. 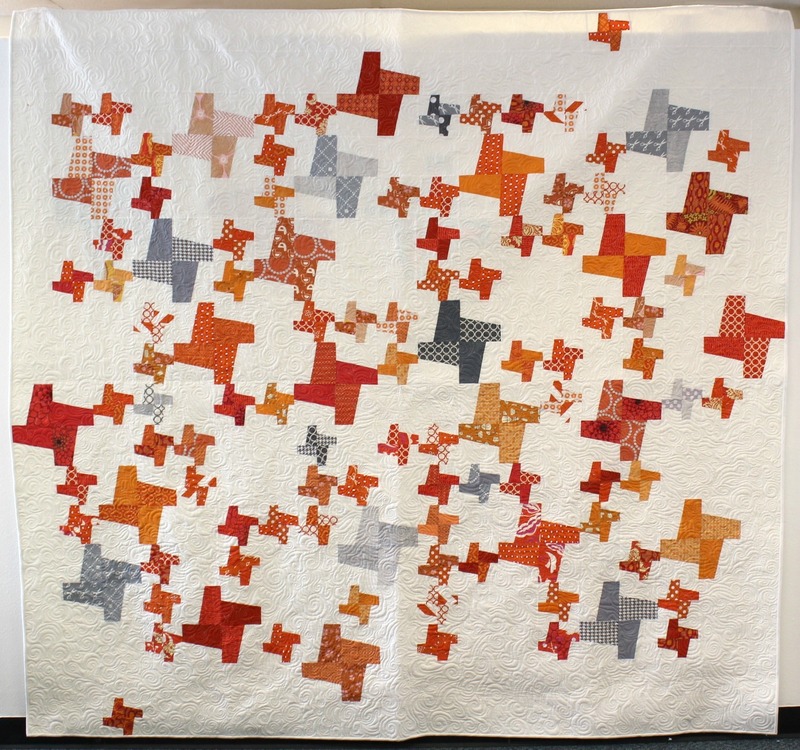 I love your inspiration quilt, the orange and white Burgoyne Surrounded. Your backing is stunning with all of that quilting showing! You have created a beautiful and original quilt. it's gorgeous! thank you for sharing a lovely treasure! I can see how that orange (and it was definitely orange!) Burgoyne Surrounded quilt would be an inspiration, but I also love what you created. Great work! I really love orange too and this quilt is just stunning! Great work! Wonderful! Love it. The back is amazing. This is such a beautiful quilt, I am so glad to see it featured here! What a treasure. I need a snowstorm to show off a few tops I have completed! Absolutely beautiful!!! What is FMQ quilting and did you quilt that whole quilt on a home machine? If so I am totally impressed. Oh my...such beautiful eye candy here! What a neat way to bridge time with quilts.